Garden Update – Squash Everywhere!! When will we ever learn? We always plant zucchini and yellow crookneck squash, but this year we added spaghetti and acorn squash! 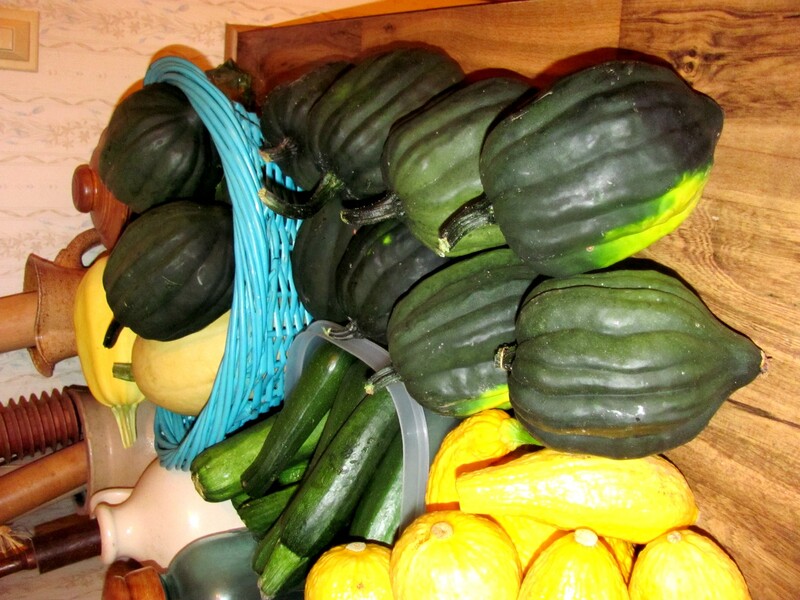 The picture shows our first harvest of acorn squash! I didn’t know it would be so prolific. And, there are still more coming on! Does anyone know how to store these babies so we can have them over a period of time? Any good recipes? I usually just back with butter and brown sugar. Chuck loves this, but I’d like to try something new. Have a super weekend and I hope you all stay cool, we are having a scorcher here in East Tennessee. I need to do some weeding but can’t make myself go outdoors. This entry was posted on June 23, 2012 at 1:53 pm and is filed under Uncategorized with tags Acorn squash, crookneck and spaghetti squashes, Zucchini. You can follow any responses to this entry through the RSS 2.0 feed. You can leave a response, or trackback from your own site. Holy moly! That’s a lot of squash! I didn’t even plant a garden this year. We’re so dry and haven’t had any rain for months. I didn’t want the tedious job of being stuck at home having to water 3 times a day all summer so the garden plants wouldn’t dry out. The peach and apple trees are heavy with fruit, though, so at least we’ve got something to harvest this summer.